As the unofficial in the US, but widely celebrated in America, holiday of St Patrick’s Day approaches, I’d like to review the long ties with Ireland that the Clan MacLeod has. Pre-dating the clan, the group now called Scots and Gaels came from Ireland in the 3rd and 4th century CE and settled in an area of Scotland called Dalriada, and then Argyll. 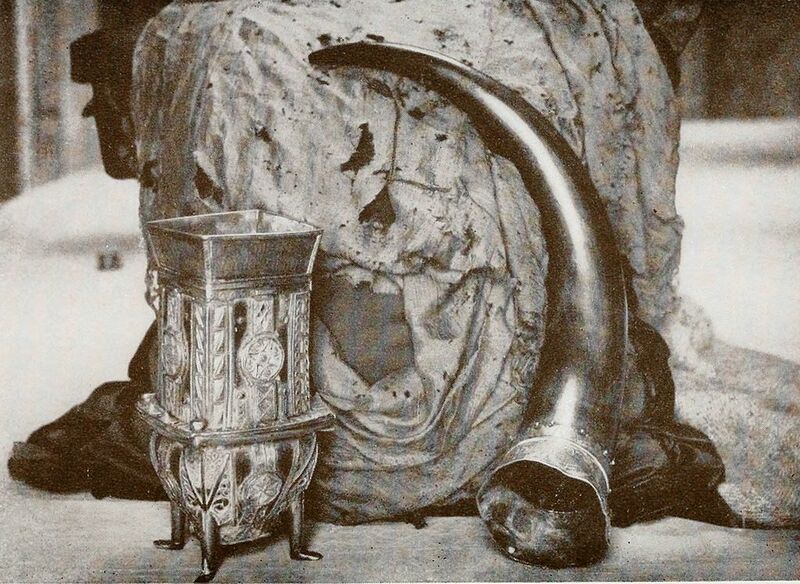 St Columba, founder of Iona where the early Chiefs of MacLeod are buried, was the one who placed St Patrick’s relics in a Shrine 60 years after his death. The Irish Viking Kingdom of Dublin in the 800 and 900s was also ruled by the Ui Imair, which is thought to be somehow related to the later Crovan dynasty that Leod was related to. Next, in the mid 1300s, 4th Chief of Clan MacLeod, Iain Ciar, married the daughter of “The O’Neil”, the head Chief of the powerful O’Neil clan that ruled much of Northern Ireland. Both were not well liked however, and were said to have burned their daughters alive in Dunvegan’s dungeon for marrying against instructions. In 1594 Roderick “The Great” the 15th Chief, better known by the Gaelic form of his name, Ruaridh Mhor (Sir Rory Mor) and his in-laws the MacDonalds raised a force that supported the rebellion of Earl of Tyrconnell, Hugh Roe O’Donnell, against the English in Ireland, and brought back the “Dunvegan Cup” as tribute given to him there. He went again with 600 men in 1595. Shortly after, a feud with the MacDonalds erupted, and that series of fights was the last of the clan battles on Skye–the “War of the one-eyed woman”. The cup, once though to have belonged to Niall Glundub, founder of the O’Neills is now thought to be an example of a Meather from 1493. Many of the Gallowglass who fought in Ireland stayed there, as did less of the later Redshanks mercenaries. One MacLeod in 1690 even hired into the forces of William of Orange in the Williamite Wars of Northern Ireland, even though his descendants later became Catholic and live in the Republic of Ireland today. Dubhaltach Óg mac Giolla Íosa Mór mac Dubhaltach Mór Mac Fhirbhisigh, the Irish author of the Leabhar na nGenealach from 1650-1666, wrote about genealogies connected to the MacLeods that have recently shed light on some interesting questions when it was finally published 300 years after it was written. One final sad link with Ireland was an early incident of clearances, where in 1739 tenants of MacDonald of Sleat and MacLeod of Bernera were kidnapped from Harris and Skye with the intent to sell them into slavery on American cotton plantations and the sugar plantations of the West Indies. This is called the Soitheach Nan Daoine, “Ship of the People” incident. The ship, the SS William, docked at Donaghadee in Ireland to take refuge from a storm and the prisoners escaped from the barn they were locked in overnight. Most of the 100 escapees remained in Antrim, Ireland as they had no way to pay to get back to their homes.